When I started decorating cake years one of my first failures as a cake decorator was my ganache. I made a delicious ganache, it looked so delicious. But when I covered it with fondant it was a big mess. The ganache was soft so covering the cake with fondant was an absolute nightmare. And I wondered, how do they do it? How do these successful cake decorators have ganache cakes that don’t look like it’s melting? When they cover the cake, they are not struggling like me. Well, it took me a few times to realize that I was using the regular chocolate ganache recipe. You see not everyone tells you these things and sometimes you have to read between the lines in forums and cake websites to know these hidden secrets. 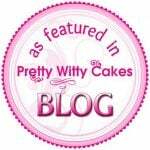 Which is why I started this blog. No hidden secrets. We all have the right to knowledge. 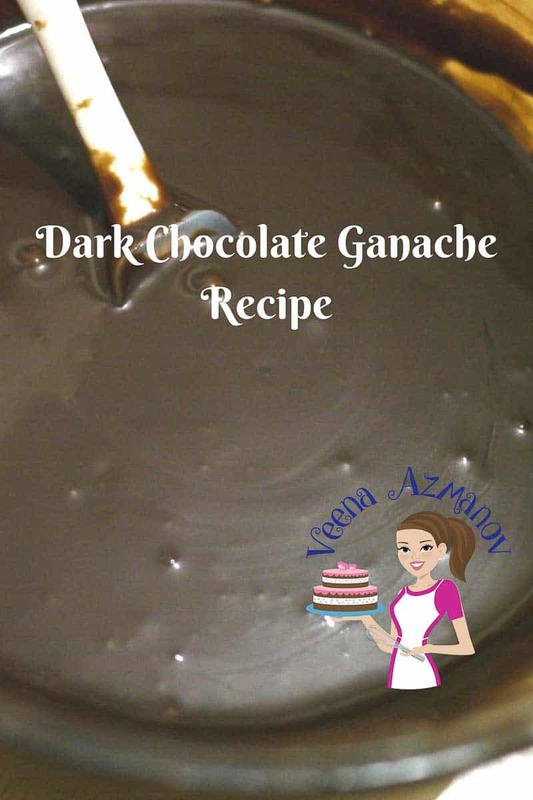 So today, I want to share with you the ganache recipe used by cake decorators to ganache cakes. These are not dessert cakes. 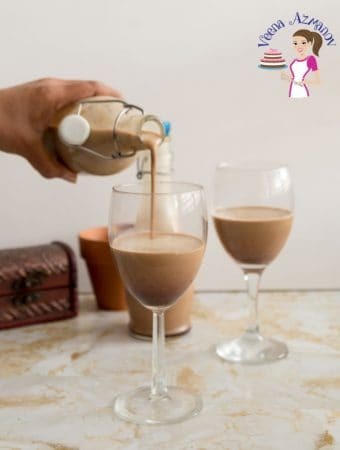 For dessert cakes, you use these regular soft ganache recipes here – regular chocolate ganache recipe and white chocolate ganache recipe. 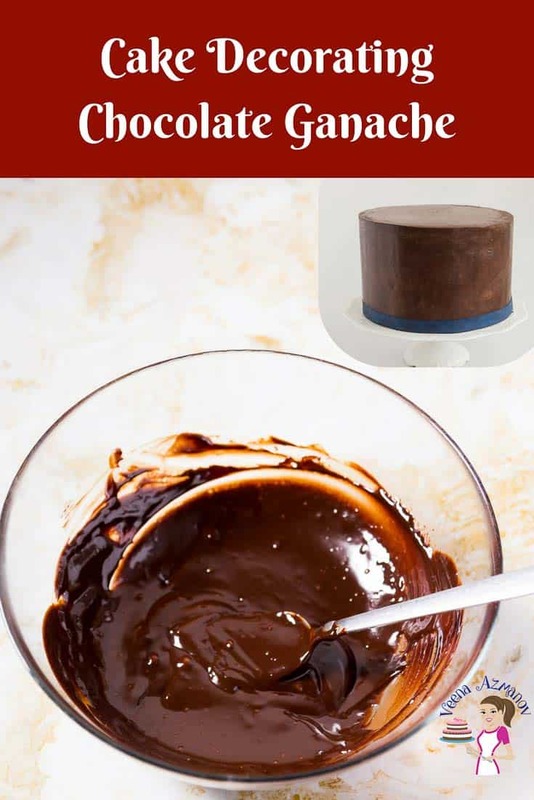 This is the ganache you use under fondant, or when working with a novelty or sculpted cake. This is the ganache you use when you want to get sharp edges on your cakes. Are you ready? Chocolate – ganache can be made with any chocolate, coverture or compound. The quality of chocolate you use will determine how delicious your ganache will taste. I use Callebaut or Laubeca. 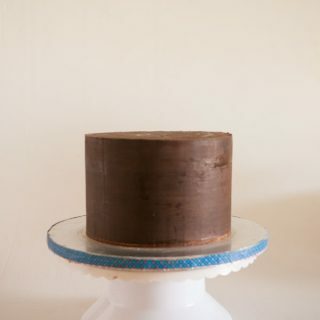 Most of my ganache cakes have 70% cocoa dark chocolate – the reason I like to use dark because I usually fill my cakes with buttercream, so the dark chocolate cuts down some of the sweetness. Having said that you can use any percentage of chocolate from 55% to 90%. White chocolate – works differently from dark, semi-sweet or milk chocolate so will cover that in another post here. I will explain in detail with a video how I made my white chocolate ganache. Cream – The high the percentage of fat in the cream the creamier and richer the ganache. In some cases, it will bring out the sweetness in the chocolate as well. I usually use no less than 38% fat I think it always has the best consistency for the ganache. Having said that you can use anything from 32% to 45%. If you are unable to use fresh whipping cream you can also use coconut cream and follow the same exact process we do below. 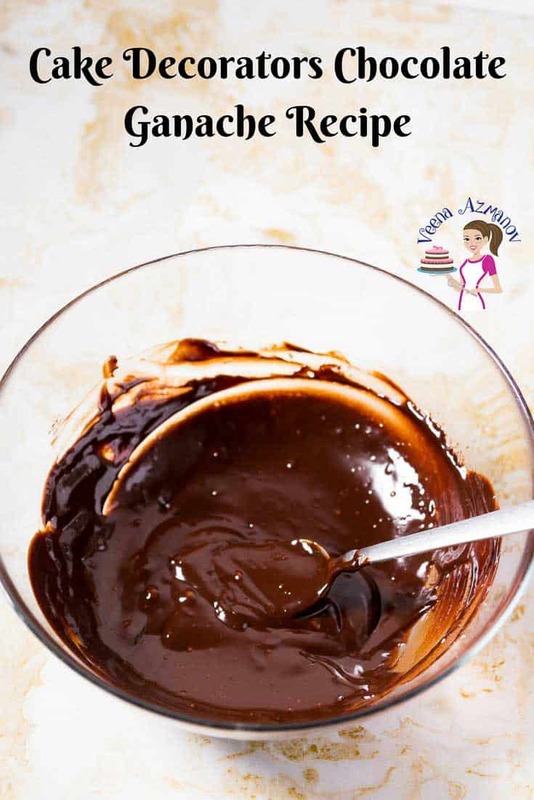 This is the simplest ganache recipe you can make for your desserts, cake, cupcakes. You can use dark, semi-sweet, or milk chocolate. 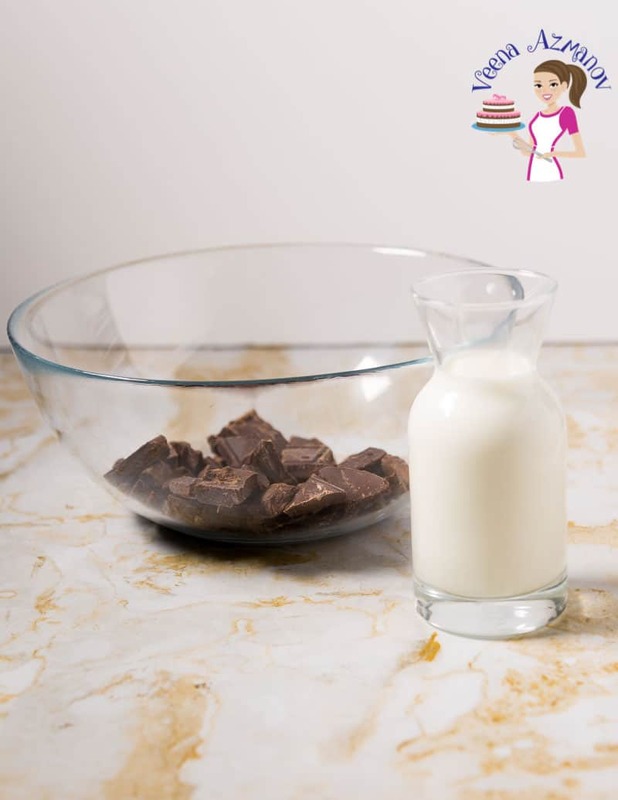 Need to make Cake Decorators White Chocolate Ganache? 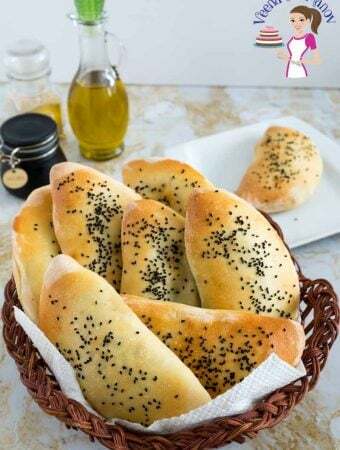 You can use my recipe here. Note: This recipe is just enough to fill and frost a six inch round cake. If you fill the cake with vanilla buttercream and frost with this ganache you will have some left for piping borders. This recipe can be easily doubled or halved without any issues. When cake decorating we do not use the ganache soon after it’s made. We let it rest. This helps firm the ganache again and give it the stability we need for covering a cake. We covered this as well with video tutorials. You can find them here. 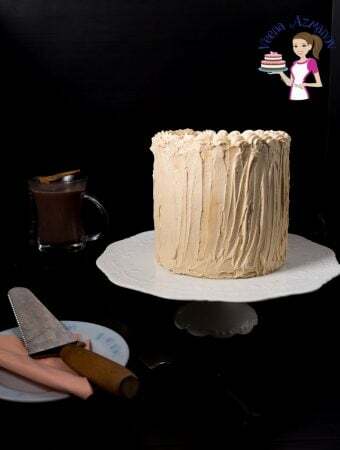 Since chocolate can withstand heat better than butter, ganache frosting is usually more preferred by cake decorators under fondant than buttercream in summer, or humid climate. In fact, summer here in the middle east is so hot that I do not offer buttercream under fondant at all. It’s only ganache cakes in summer. Why? Well, my home is cold so the cake stays in the airconditioned room and looks perfect, but what happens as soon as you take it out of the house? Here in the Middle East, it is like stepping into an oven. The cake has no fate but to melt away. The last thing I want is for the person to be halfway home calling me that the cake is a mess. 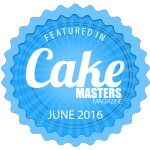 So… no buttercream cakes in summer. Have you ever wondered how to take Ganache to a whole new level? Yup? 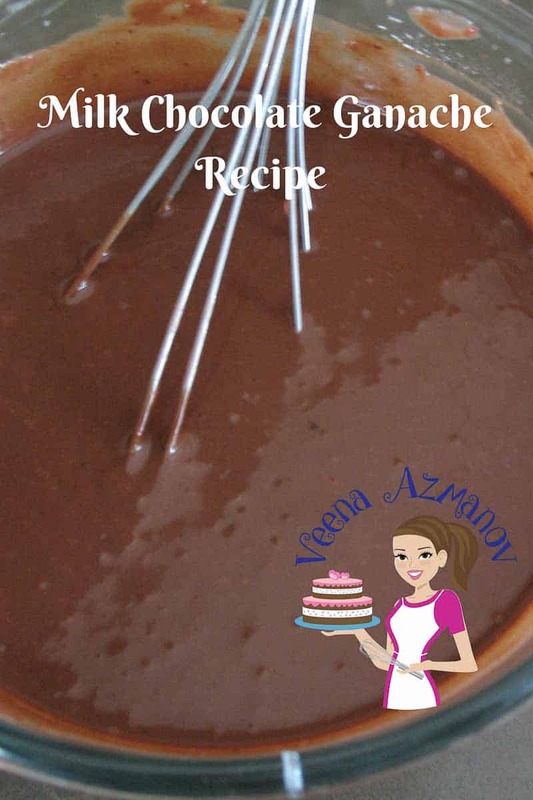 Have you tried to add different flavors to your ganache? Nah, I’m not talking about extracts! 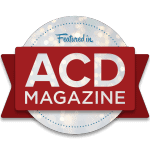 I’m talking more… check it out here. How to flavor ganache a million different ways? When cake decorating we do not use the ganache soon after it's made. We let it rest. 1)Can i bake cake and freeze it 2 weeks ahead? 2) vanilla cake with vanilla buttercreabuttercream filling +chocolate ganache. Would that taste alright? 3) how long can i refrigerate ganache. Yes, you can bake and freeze the cake in advance. Thaw it in the fridge overnight not at room temperature the cake will be moist. Ganache can be kept in the fridge for a few weeks -wrap it well. Happy Birthday to you son. Highly appreciate your suggestions veena. You are a legend. Thank you. I tried vanilla cake with milk in place of cream; Could you also please tell me, what is to expect when replacing milk with cream. Can’t wait to try the new recipe? How long ahead can I prepare and freeze buttercream filling, or is that to be used fresh to maintain the taste? Hey Veena. The cream is also part of the fat in the recipe so replacing it with milk will make it less rich. Buttercream can be made a few days in advance and kept in the fridge. Each buttercream has its own shelf life – please read the storage instructions for that particular buttercream on the post. 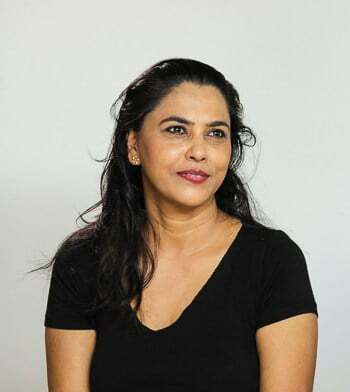 Hello Veena. Thanks for this recipe. I follow you from Africa 🙂 and heavy cream costs a fortune here. Can I use unsweetened condensed milk instead? Hey Rosa. Sorry to hear that fresh cream is so expensive there. Technically I don’t see why it would not work. 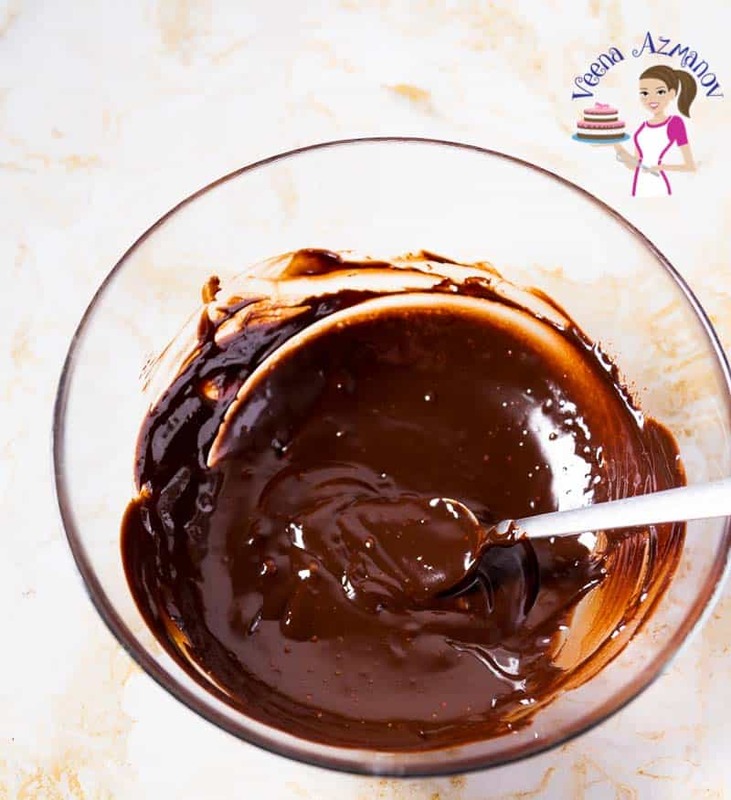 But do this as a test – use 100 grams chocolate and 1/4 cup unsweetened condensed milk – melt and stir just like ganache. Be careful when melting – stir often. Look for consistency. Make sure it’s spreadable not fudge like. If you overheat it will be fudge texture and that won’t give you a good spread. Spread it over Clean chopping board or such textured surface.. see if it dries smooth or brittle. If its’ smooth it should be ok. If not it may not work well under fondant. May end up with cracks. Hi! Can i use the decorators ganache recipe for whipped ganache instead of the regular ganache? I want my ganache to be lighter in color for a semi naked cake but i also want it to be stable and can stand the hot weather in my country. Hey Tata. Yes, you can use this for whipped ganache but since the cream in there is so little you won’t really get a good whipped effect. 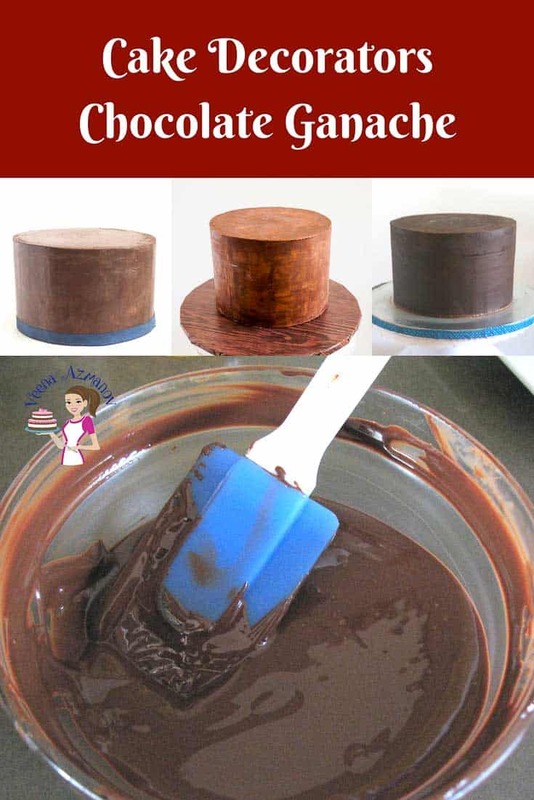 If you want your ganache to be light in color use the regular Classic Chocolate Ganache. That has more cream so it will whip light and fluffy too. I think whipped ganache if used minimum on a naked cake may be ok for hot weather. Tha ks for the recipe Veena. Will this affect the flavor of the cake? Say, they want a vanilla cake with vanilla frosting. Wont covering it with chocolate ganache change the flavor? How can I use this recipe to get sharp edges without changing the flavor of the cake asked for? If you use chocolate – it will taste like chocolate. Chocolate is a strong flavor so while we use it for the firmness we also have to accept that it will taste like chocolate. You can use white chocolate for a less intense chocolate taste but there is still chocolate. 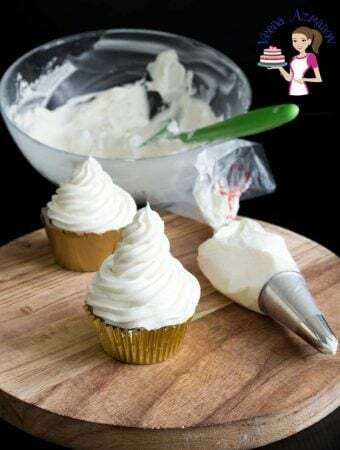 The other option is to use buttercream – use my post how to get sharp edges on buttercream and see if that method helps. Thanks Veena, I appreciate your reply. 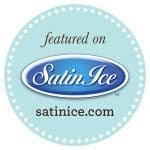 I’m looking forward to trying your flavored ganache recipes! 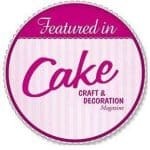 Have you flavored your cake decorator’s ganache recipe with all of the options you suggest and still keep a stable ganache that produces sharp corners for fondant application. (especially when adding large quantities of flavorings like – peanut butter, nutella, and caramel? Thank you! Hey Michelle. Almost all of these will work well as filling and frosting. 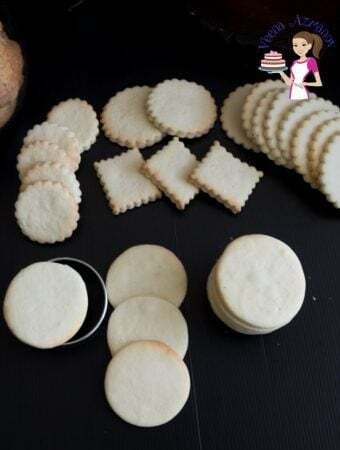 Personally, if I need to drape with fondant, I will use these as a filling and then use a plain vanilla flavored ganache for frosting, just so it will be stiff under fondant and give me enough working time because humidity here in Israel is crazy. I hope that makes sense. For fruit favors, I would only use them as filling. Very helpful! Thank you so much Veena! I hope you see this comment as its on such an old post. I go so excited at the title – cake decorator’s ganache. But i realised it’s the ganache I’ve always made. I tried it again yesterday. And the same disaster. It’s nice and firm with a sharp edge till i put the fondant on. Then it’s a sticky hot mess and the weight of the fondant drags the ganache down too and everything sags and bulges. It doesn’t help that I live in Bombay on the sea-shore.I’m desperate to make cakes that look great with sharp edges. Even in what passes for winter here, it’s the same. I’ve tried different brands, pure chocolate, chocolate compound…everything. It never works. 🙁 Any suggestion would be welcome. I see all post unless it goes to spam so feel free to comment and ask anything on olds post too. Actually, I lived in Bombay and I have used ganache. In fact, I remember giving my niece a quick course on how to ganache a cake and cover it in fondant. The ganache was not bad. If I remember correctly. – I made the ganache with more chocolate and less cream – less than this as well. -I made the ganache and let it set in the fridge overnight. – Next day, I kept it out for an hour the gave it a good whip by hand using a spoon until it was peanut butter consistency. 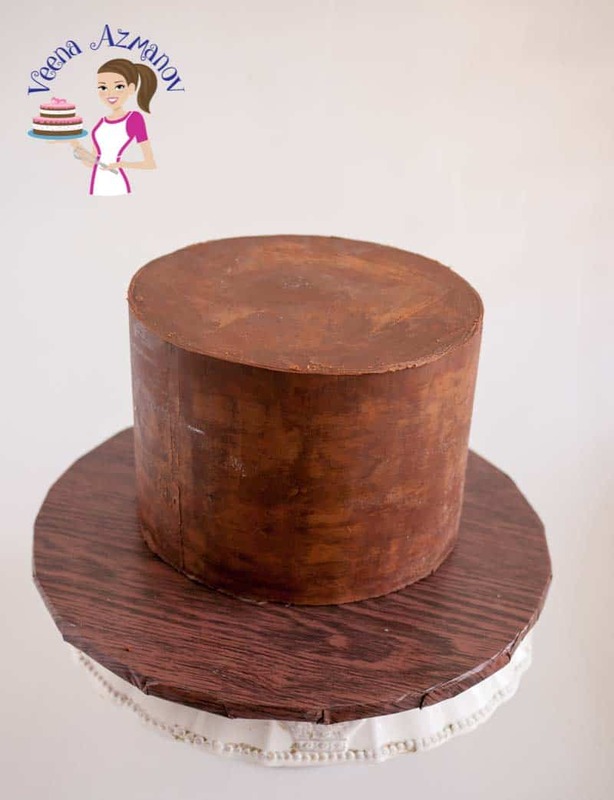 – I covered the cake in ganache – one coat – chilled an hour. 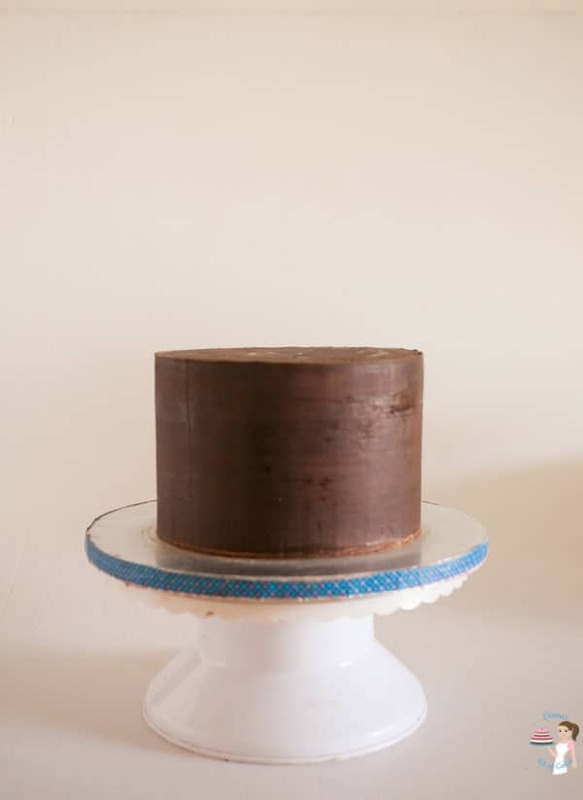 – covered the cake in ganache again – final coat and chilled overnight. 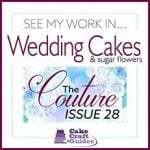 – Next day – I took the ganache cake out just when I started rolling my fondant. – Before I put the fondant on the cake. I rubbed my hands on the ganache cake to spread the condensation that was just starting out. 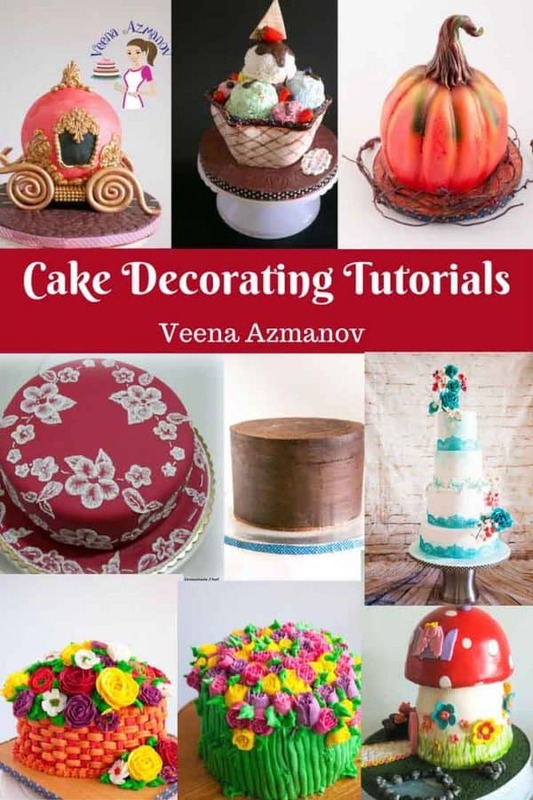 – covered the cake – with fondant – quick sharp edges. – then we decorated the cake once the fondant dried. 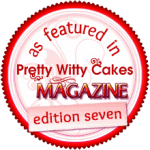 – I know with places that have high humidity fondant in the fridge is not a good idea. So leave it out. Not sure I have an answer to your question but see if my process on top gives you any ideas. Also when you roll the fondant – roll it a bit thicker and not a big skirt. Remove excess quickly. Work in an airconditioning room or choose to work in the evening when its’ cooler than the day. I think compound chocolate such as chocolate chips works better as they are meant to handle heat and still hold their shape better. I have tried higher proportion of chocolate to cream. Same results. But I shall try the slow steps like you mentioned. I tend do do everything at a rush on one day, in a few hours as I’m constantly afraid the cake might go bad in the insane heat. There is an additional problem I face. Being an ecologist by training and conservationist by passion, I do not have air-conditioning in the house. This makes a world of a difference and reading your buttercream post made me realise you’re the first person who understands what I’m talking about. When you say (to paraphrase), ‘I could have it all cooled and perfect, but it could turn into a hot mess in the client’s car’. A lot of people do not have a/c. I don’t want the cake to turn into a mess when it leaves my house. So, looking for apt solutions. Wonder what people who have outdoor weddings/functions in hot places do? Thanks once again for the response. Much appreciated. 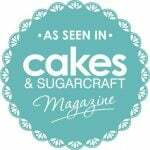 yes, one of the big issue with cakes is when you try to do it all in one go. The best way is to space the work and let it rest so it has time to set. Cakes baked from scratch have a longer shelf life and taste better over time. We have to all work with what we have and the circumstances we live in. For example, in summer I never sell buttercream under fondant. I do have Air Conditioning but I can’t keep in on 24 hours – not worth the electricity bill – right? 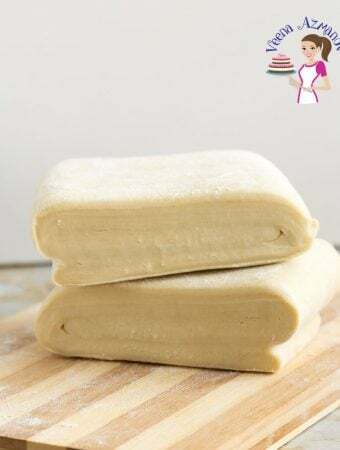 I highly recommend you work slowly – cover the chilled cake with fondant and don’t put fondant cakes in the fridge since you don’t have air-conditioning. I’ve never tried ganache on a cake. I thought it would be too difficult and I’d make a mess out of the cake. You certainly make it sound doable. I’m pinning your tutorial and I will give the chocolate ganache a try. We love chocolate so it would be very much appreciated. Keeping my fingers crossed I don’t destroy a ganache nor a cake. Ganache is so easy to make Marisa. You must try. It’s absolute chocolate heaven. Ganache always makes this look so elegant. 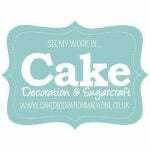 I love using it on cakes and cupcakes. Makes it look fancy…and isn’t that difficult to do. 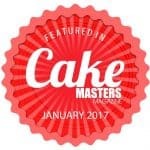 I need all the help I can get to make cakes look 1/2 as good as yours. Thank you, Gloria. It really is easy, just time-consuming. Thank you Thank you Thank you so much Veena. You just told me everything I need to know about Ganaching my cakes. I had the same confussion as you.